Alao-Akala dissociates self from “Sai Buhari, Sai Akala” posters. 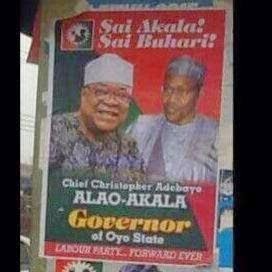 The gubernatorial candidate of Labour Party in Oyo State, Adebayo Alao-Akala, has distanced himself from posters bearing his picture and that of President-elect, General Muhammadu Buhari. The circulation of posters which began in Ibadan, Oyo State capital last Wednesday raised many eyebrows in and outside the state with many believing it is a clever ploy to ride on the goodwill of the retired military officer. Mr. Alao-Akala, who spoke through his media aide, Oludare Ogunlana, said that “though I have no hatred for the newly-elected president, but why would I use his picture to sell my candidature at this point when it is certain that the incumbent administration has few months in office”. He affirmed that, “I am a member of the LP while the president-elect is of the APC. It is shameful for the dying APC administration in the State to resort to such indecent propaganda when it is very obvious that their administration is living on a borrowed time. “Such political lies wrapped with expired fallacy can only be marketable to politicians of yesteryears. Deliberately, they went to the press to react thinking that people will succumb to their lies. Those eras when lies thrived are gone for good. Governor Abiola Ajimobi should be preparing his handover note because the people have already resolved to send him packing”. Get Trained This October! Attend The Digital Marketing and Online Media Training.